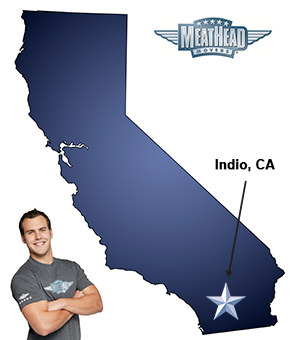 With plenty of moving services, Meathead Movers is fully prepared to make Indio your new home. Our clean-cut student athlete movers are dedicated to fulfilling all your moving needs efficiently. Welcome to Meathead Movers of Indio! You wouldn’t think that a city located in Southern California’s Colorado Desert region would be a magnet for people from all around the world, but that is exactly what Indio, the city of festival does. Located in the Coachella Valley, this city is home to world renowned festivals like Coachella, Stagecoach, the Southwest Arts Festival, and even the Indio International Tamale Festival. This city attracts visitors alike and during its peak season is even a playground for the rich and famous. Besides being a city of festivals, Indio is also an excellent place to raise a family. Affordable cost of living, good schools, and a growing working class, make Indio one of the top 20 cities for young families. It’s no wonder Indio is one of California’s fastest growing cities. If you are considering moving to or from anywhere in Indio, we are the moving company for you! Our professionally trained student-athlete movers and our move concierge are here to help you with every stage of your move in Indio. Our moving company specializes in local, long-distance, and commercial moves to, from, and within Indio. We also provide reliable packing, storage, on-site relocations, and our distinctive moving concierge service, which connects you with local service providers. All our student-athlete movers are thoroughly screened and trained before their very first move. With branches not just in Indio, but all throughout California, we are your one-stop resource for all your moving needs, no matter where your California move takes you. In fact, you can see what your neighbors in Indio have to say about us! With our 100% satisfaction guarantee, the only thing you have to lose is the stress that comes from moving! So contact us today for a free no-obligation moving quote and to learn how we can help you on your next move! Moving to Indio? Here are some helpful resources. Fabulous crew of young men. Very professional. The gentlemen who moved us were kind and friendly. They made a great effort to insure our items were not ruined during shipment. They were very fast...running to and from the truck. Thanks again. During our move, my husband who is an active duty member of the United States Marine Corps was deployed to the Middle East. The military did not pay for our move, because he was not changing duty stations. We have two dogs, one of whom had an infection at the time of our move, and wasn't feeling well. I am a registered nurse and work full time in a correctional facility, but was also going to be starting a new job the week after moving. Even without having to worry about moving, the dogs and work can be a handful. Greg was my customer service representative, he was courteous, respectful, very helpful and detail oriented with information, and something that is important for me with sales type representatives is that I feel they are honest and forthcoming with information that may even lead me to chose another vendor. He informed me about the law in California about double drive time, and after shopping around more, found that other companies were more expensive and were even going to try to charge me for their drive time back to their warehouse. I felt like Greg truly was looking out for me, since I am not in anyway versed in the moving industry. That was important to my husband and I since we heard stories about hidden fees and people trying to take advantage of a woman who may not have known better. My three student athlete movers, showed up early, were dressed and groomed well, and very courteous to say the least. They always offered to answer any questions, they worked very hard, and honestly watched them closely, and I don't think I ever saw a time that they weren't doing something for the move, minus breaks. It was very hot on the day of my move, and I believe it got up to 120 degrees. They never complained or even stopped to rest. They explained to me everything that I asked, step by step throughout the whole process and constantly checked with me on where things should go and sought my approval before packing or unpacking things. I can't say enough about how stress free this move was for me and about how thankful/appreciative I am that I had such a great experience. I would definitely recommend these services to anyone, and if I am able to with our next move, I will use meathead movers again.